Early in the fall I was contacted by the folks at the Food Network Magazine. 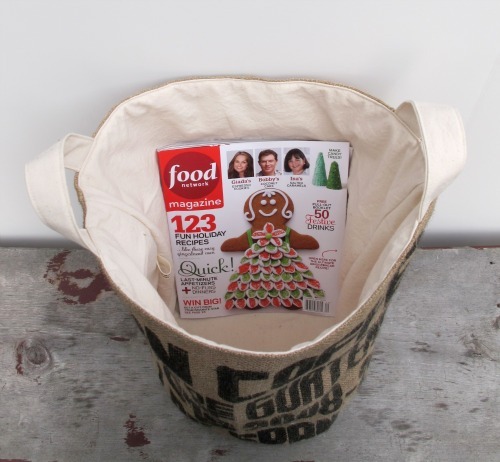 They were interested in featuring one of my burlap buckets for their big holiday gift guide. Exciting stuff, even if I've slowed down on production work. I was asked to make a custom sized one for the guide: a super duper huge version! As a rule, I rarely do custom orders. This seemed like a good time to make an exception... don't you think? FGM's request was that I have it for sale directly on my blog, so I made another bucket with one of my favorite coffee sacks and the same dimensions as the one shown in the guide below. Can you find it? My big ol' bucket with wonderful bold black typography will be available right here in tomorrow's post. I got into a serious sewing groove on Saturday and crafted four more various buckets and lots of sweet little somethings with those "components" from Thursday's post. More on all of that in the morning. Here are three of the buckets awaiting their finishing steam iron touch up. To give you an idea of size, the smallest is my usual large! congrats! that's so exciting! they're quite the beauties! Awesome. I need one of these! Congrats on having your lovely bag in the magazine! How exciting! And the buckets are seriously beautiful. I love the huge one! They are great! I love that material and specially love the idea that they came from far away countries and are now being used again. It must be exciting to see your work in a magazine, congrats! congratulations!this is really exciting news! i'm so happy for you!and the x-large buckets will definitely find a good use! Everyone knows a good thing when they see it! Congrats on another "big look" at what you do! 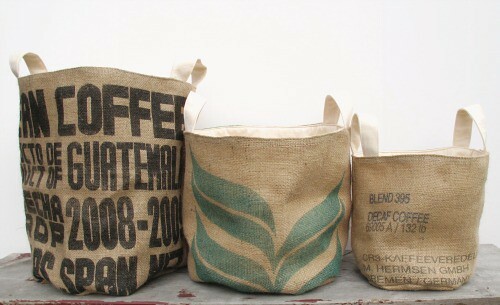 I love, love these burlap bags. I saw this in my copy of the magazine the other day and thought, HEY! I know a lady that makes those... Little did I know it WAS you. I thought someone stole your idea. I'm glad that's not what happened. Congrats!